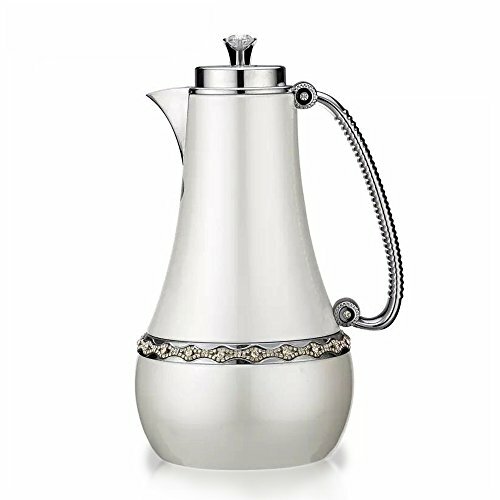 Eglaf insulated carafe was made of stainless steel exterior and ABS glass liner. Whatever you pour hot or iced drinks, you would not be hurt when you touch the carafe. According to our customer's feedback, she boiled the herbal tea and poured into the carafe in the morning. During the lunch time, the herbal tea still kept fresh. Of course, her guests enjoyed it and had a good experience of the carafe. The hotter the water,it wiould stay hot for longer. Thermal Coffee carafe holds 1 liters(34 oz) liquid and great for serving hot or cold beverages. Every gem is mounted carefully by hand. It passed keep it hot/cold text at least more than 12 hours. The solid double-wall stainless steel construction and insulation ensures that the heat doesn't escape the carafe whilst keeping the outside cool and easy to touch/hold. Ideal for home,office and party use, as a tea/coffee thermos, milk carafe, creamer carafe, juice, wine, water pitcher.